Diana’s career as a mental health advocate for persons with mental illness and other disabilities began in 1995 when she connected with an advocacy program called “Partners in Policymaking”. Through this nine month advocacy and leadership training program sponsored by the Texas Council on Developmental Disabilities, she developed the skills necessary to effectively testify for increased funding and improved mental health services. It was also through this comprehensive advocacy program that Diana discovered her leadership abilities and became known around the state of Texas as an influential voice for persons with mental illness. Diana was employed at NAMI Texas (National Alliance on Mental Illness) from 1999 to 2007, working in numerous capacities: consumer advocate, I & R, public policy coordinator, newsletter editor, affiliate coordinator, meeting and conference events planner, NAMIWalks manager, fundraiser, representative to state mandated workgroups and NAMI Texas consumer spokesperson. Among some of the audiences that Diana has addressed are: College and Graduate classes in Social Work, Psychology, Rehabilitation and Public Policy; local and state health and human service agencies; NAMI Family to Family classes; inpatients and outpatients; several churches; numerous conferences; and CIT (Crisis Intervention Team) Trainings throughout the state. Blessed with so many diverse opportunities and experiences, Diana made the difficult decision to leave her job at NAMI Texas and “follow her bliss” as a public speaker, writer and consultant. Chester and Diana. As a Pet Pard’ner, Chester visits patients at Austin State Hospital bringing joy and love! 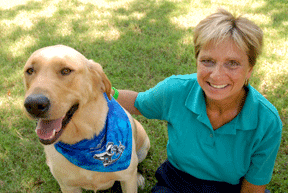 Read an article about the Pet Pard’ner program and the healing power of our pets. Everyone in Diana’s family wears the green EXPECT RECOVERY! bracelets..even Chester Brown and his mother Lily Belle!